Carolyn admires diaphanous, beneficence, synergy, angelic, and disingenuous. Shannon seconds disingenuous, and adds exacerbate, perpetuate, suffocating, psyche, smitten, whisper, plummeted, and oxymoron. Rendezvous, robust, and apple are Lauren’s gems. Mike cited panacea and delicious; Jessica golden and penumbra, Akeela jewel and mesmerize. Perhaps surprisingly, there is no consensus among linguistic experts. To author James Joyce, cuspidor is the most beautiful word. Novelist Henry James preferred the languor of summer afternoons. Famously, writer Dorothy Parker accorded beauty to check enclosed. Lexicographer William Funk draws tranquil, melody, murmuring, luminous, and lullaby among his faves. Crystal, shimmer, champagne, laughter, and butterfly make beautiful poetry for John Kitching. Has This Been a Joke for 100 Years? The lagniappe often cited as the most fetching in all English is cellar door (I know, it’s actually a two-word combination). Not kidding. In an article in the New York Times, “Cellar Door,” Grant Barnett noted H.L. Mencken, J. R. R. Tolkien, the novel Gee-Boy, and the movie Donnie Darko as perpetuators of this notion, but no one has been able to prove its origin. What Makes a Word Beautiful? Why would anyone choose “cellar door,” for example? Most people consider a word beautiful if it sounds mellifluous, like efflorescence, hush, serendipity, and halcyon.. Perhaps cellar door was a mondegreen. Even esoteric words like desuetude, chatoyant, and potamophilous can be enjoyed for their euphonious sounds. Then there are words that feel beautiful because we associate highly-charged personal emotional experiences with them: mother; love; and my son Matt’s contribution, You don’t want to know Lol, which invites a plethora of ineffable postulations. Some words are beautiful because of how they feel on the tongue—velvet, denouement, labyrinthine—or how they look when written—Elizabeth, onomatopoeia, committee. Others conjure beauty because they evoke images in our minds: cerulean, seraglio, petrichor, crevasse, kiss. Linda may have suggested babies with this in mind. Sociocultural ramifications may give words beauty. Thank you, share, and apologize may be considered beautiful in this way. Is fun beautiful? Some people think so. Words like stringier and startling can be reduced by one letter at a time and still remain viable words (stringier –r = stingier –i = stinger…). Sonia called turtle and purple funny. 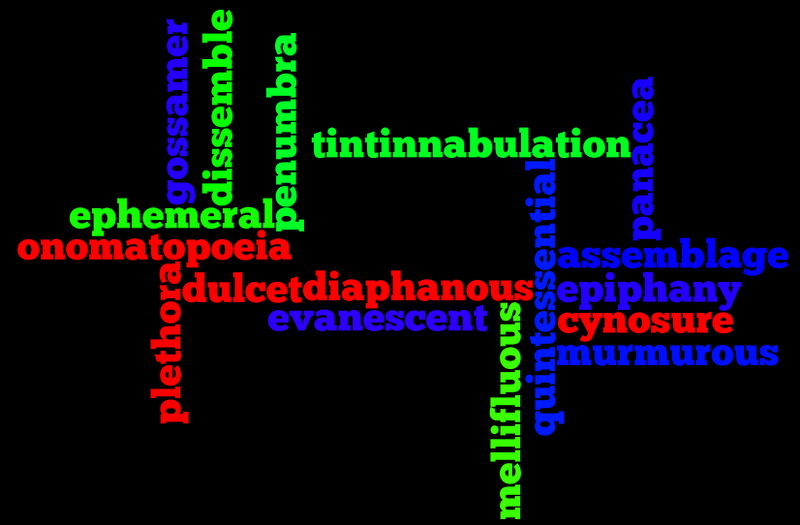 So can’t we draw any conclusions about the most beautiful words? Actually, linguist David Crystal has. So, revel in the cadence of whichever mellifluous, murmuring susurrus evoke a symphony in your ears and make your days idyllic and sublime. Namaste. Share your Top 10 below. Previous Previous post: I (Used to) Hate Poetry!